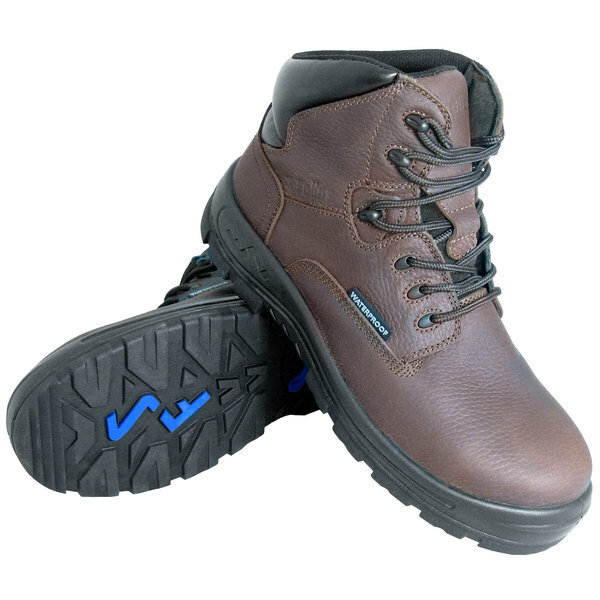 Help reduce workplace injuries with this pair of Genuine Grip 6051 Poseidon men's brown waterproof boots. These composite toe work boots are designed to protect feet when there is a risk of falling objects or electrical hazards in the workplace. In addition, their non metal construction makes a great alternative to steel toe boots since they're lighter to help reduce fatigue, they won't interfere with metal detectors, and they're completely waterproof. The uppers on these shoes are made from high quality full grain leather, and each pair comes with laces to give your staff a snug and comfortable fit. This stylish and durable upper is paired with a patent pending slip-resistant rubber outsole to protect against potential slips or falls. Falling or slipping are amongst today's leading causes of workplace injuries. Keep your workers safer with the assurance of Genuine Grip's slip-resistant footwear. Providing footwear in the industry since 1932, Genuine Grip's footwear is created with industry-leading technology including some of the best slip-resistant soles on the market. Keep your employees safe and comfortable by protecting against the unavoidable hazards of your business's day-to-day operations with this Genuine Grip boot!